Melt butter in heavy large deep skillet over high heat. Add squash and sauté for 1 minute. Add broth, syrup, cinnamon, salt, and pepper. Bring to boil, cover, reduce heat to medium, and cook until squash is almost tender, about 10 minutes. Using slotted spoon, transfer squash to large bowl. Boil liquid in skillet until thickened, 3 to 4 minutes. Return squash to pan and cook until tender, turning occasionally, another 5 minutes. Whisk all ingredients together in a bowl. Serve with chicken nuggets, spring rolls, rice noodles, chicken satay, over salads. Place all ingredients in a food processor or blender and pulse until smooth. In a 4-quart pan or Dutch oven, over medium-high heat, heat oil and half the butter until oil sizzles. Sprinkle the pork pieces with the salt. Brown the pork in the hot oil on all sides, about 10 minutes; remove from the pan and set aside. Remove all but 1 tablespoon of the oil from the pan, add the vegetables and sauté until softened, about 5 minutes. Add the beer, beef broth, pure maple syrup, soy sauce, bay leaf, thyme and browned pork. Bring to a boil, cover the pan and lower the heat. Simmer until meat is tender, about 1 hour. Remove the bay leaf and thyme sprigs. Stir in remaining butter and adjust seasonings with salt, pepper and maple syrup as needed. Pop popcorn and place in a large bowl. 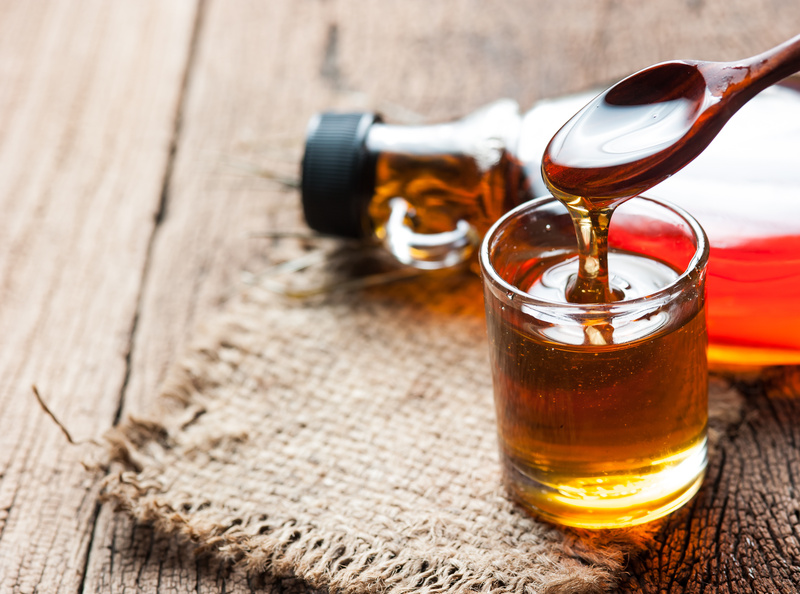 Mix maple and barley malt syrups in a small sauce pan, and bring to a boil. Lower heat to medium-low, and stir constantly for 5-6 minutes. Pour the hot syrup over the popcorn and mix thoroughly. Slightly moisten your hands with cold water, and form balls by firmly packing the mixture in your hands. Be sure to moisten your hands before making each ball. Place balls in a covered container or wrap in wax paper, then freeze until the syrup hardens. Add the cashews to a food processor along with the rest of the ingredients. (you can start with only ¼ cup of water if you want thicker consistency and add more if needed) Will keep for 3-4 days. Heat oven to 350F. Grease or cover two rimmed baking sheets with parchment paper. In a large bowl, beat together the butter, maple syrup, sugar, eggs, and vanilla until light and fluffy. Stir in the oats and currants. In a separate bowl, stir together the flour, baking soda, cinnamon, and salt. Add flour mixture to butter mixture and mix until combined. Drop by rounded teaspoonfuls about 2 inches apart onto prepared baking sheets and bake for about 15 minutes or until light brown. Cool cookies on wire racks. Makes about 4 dozen cookies. Heat oven to 350. Combine all ingredients in a bowl except jelly. Drop by teaspoonfuls onto greased baking sheet. Make an indentation in each cookie with a spoon or your thumb. Fill each indentation with jelly and bake about 15 minutes or until golden. Makes 16 cookies. In a medium-size heavy-bottomed saucepan combine all ingredients except vanilla. Place saucepan over high heat and bring to a boil. Reduce the heat to medium-low and simmer until the rice is tender about 25 minutes. Remove from heat and stir in vanilla. Can be served warm or chilled. Delicious with fresh seasonal fruit such as berries or peaches.